They're great for cozy day tours on the weekend and long-awaited hut tours in summer! Climb over hill and dale with the proper men's walking boots or shoes. You'll be well-equipped and comfortable at the same time. Various features characterize hiking shoes. They have a particular lacing style, upper material, and built-in shoe soles. 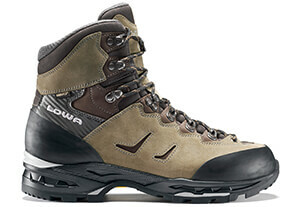 Hiking shoes or boots are well-suited for activities in low mountain ranges. They can be worn on high alpine terrain. Men and shoe shopping rarely mix. But if a day of touring leaves your feet exhausted and covered in blisters, you'll wish you had planned more carefully. The fit determines the comfort on tour. Hiking shoes for men have various last widths. Walking boots can fit any foot shape, preventing uncomfortable pressure points. A waterproof, breathable hiking shoe allows moisture to escape and keeps it from coming in. The foot climate stays comfortably dry on rainy days. Men's hiking shoes with a Gore-Tex membrane suit these needs. The upper material and inner lining determine the shoe climate. Brand manufacturers such as Hanwag, Lowa, Mammut, Salomon, and Scarpa focus on long-term durability and simple care. Aside from comfort, weight plays a role for hiking shoes. They should be waterproof on multi-day tours with sunny weather and little baggage. Walking shoes have to be robust, long-lasting, and easy to clean. Stable leather is commonly used for traditional hiking boots. A combination of high-quality synthetic fibers and suede is equally common. You can't go wrong with a Vibram sole. Sole compounds, firmness, and profile all determine grip in the field. Soles differ between walking boots and light hiking shoes that can be used as approach shoes for gentle terrain.